3D printing is this brand new manufacturing process we now have that enables you to directly build your own ideas. You design your idea on the computer using CAD software, creating whatever you’d like! Once your design is complete, you convert it into a specific file which slices your design into hundreds, sometimes thousands, of 2D layers. The 3D printer then reads this file and starts printing one layer at a time. Yes, all of this sounds fun and exciting, but how can it be helpful for the Center for Students with Disabilities? People with disabilities often have needs that require personalized equipment to help them in everyday life. Remember all those ridiculous infomercials like the Snuggie? How funny it seemed that people would be wearing a robe backwards? Well, this could actually be a great assistive device for someone with a disability, and because it is marketed to a mass audience, it’s very affordable. Assistive devices need to be cheap, efficient solutions, so why not use a 3D printer to create these tools? I am a Mechanical Engineering student at the University of Connecticut and am very interested in using the state of the art tools that are available through UConn to assist the students I work with. I want to learn how I could potentially 3D print something to assist students with disabilities at the University of Connecticut, so last week my boss, Alyssa Marinaccio, and I brainstormed. As we came up with ideas we decided we should start with something small. We went to one of the engineering buildings on campus and with the help of students in the lab we were able to 3D print the braille alphabet. With this successful endeavor, we look forward to coming up with more innovative ideas that will hopefully one day greatly benefit CSD and our student population. 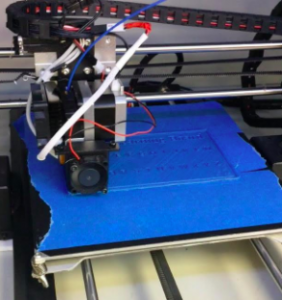 This entry was posted in Tech Blog and tagged 3D Printing, Assistive Technology, CSDTech.